When reviewing Costco products it’s also good to occasionally take a look at those household staples that you buy without thinking about. Turns out they are constantly improving them in many ways. Today we took a look at Dawn Ultra Antibacterial Apple Blossom Liquid Dish and Hand Soap for a product review. 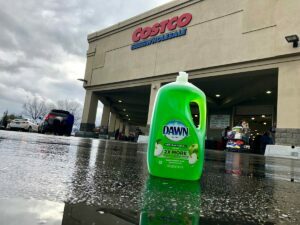 Thanks to Dawn for providing a container of their dish soap for us to review. First of all, it took us a bit to wrap our heads around what this is, as we’re so used to seeing Dawn in blue as a dishwashing soap. The great thing is they’ve expanded it to be not only a dishwashing liquid but now also a hand soap. That means the dishwashing liquid is now also antibacterial, whereas the standard blue dish soap is not. 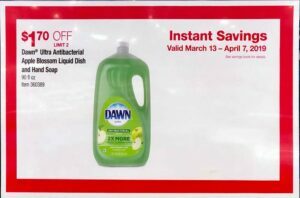 From March 13th through April 7th the Dawn dish and hand soap is in the Costco March 2019 coupon book on sale for $1.70 off the already low price of $8.49, which makes the Instant Savings final price $6.79 for 90 ounces! That means it’s a great time to give it a try! 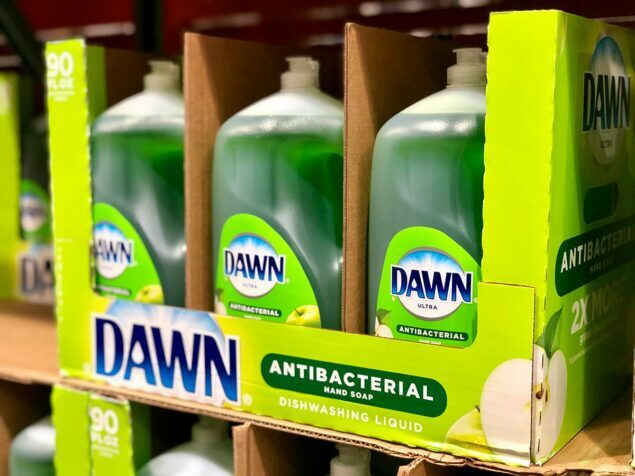 When we compared Dawn to the lesser known dishwashing soap we were using before we were blown away by the results and can now clearly see why Dawn is the #1 selling dish soap in the world. It smells better, both when washing dishes and washing your hands, which gave the feeling of being even cleaner after using it. It’s great that you can now have one product which covers two functions in the kitchen, meaning you have to store less stuff in the house. The Dawn was also a lot sudsier than our comparison soap. Also, it lasted much longer in the sponge, meaning we will go through it much slower than the soap we were using before, ultimately saving even more money.